Michael P. Bolognesi ("Bolo"), MD is a Professor of Surgery, Chief of the Adult Reconstruction Division, and Director of the Adult Reconstruction Fellowship in the Department of Orthopaedic Surgery at Duke University School of Medicine. He completed medical school and his residency at Duke, followed by a Fellowship in Adult Reconstruction at the University of Utah in Salt Lake City. After his training, Dr. Bolognesi joined the Duke academic faculty where his practice is focused on total hip and knee replacement, uni-compartmental arthroplasty, revision total hip and knee replacement, and patient outcome optimization. He conducts a high volume of clinical research focused on studying the outcomes of these procedures as well as investigating the introduction of new technologies to advance this field of care. 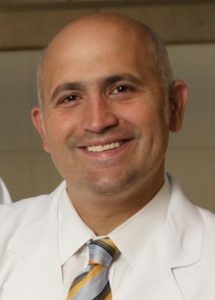 Dr. Bolognesi is extremely well-published and sits on the Board of Directors as First Vice President for the American Association of Hip and Knee Surgeons, is a member of the Knee Society, as well as the Hip Society and has also served as President of the North Carolina Orthopaedic Association. He and his wife Kelly truly enjoy their three children.... John (age 13), Rina (age 11), and Julia (age 9).